New pictures added at the bottom!!! 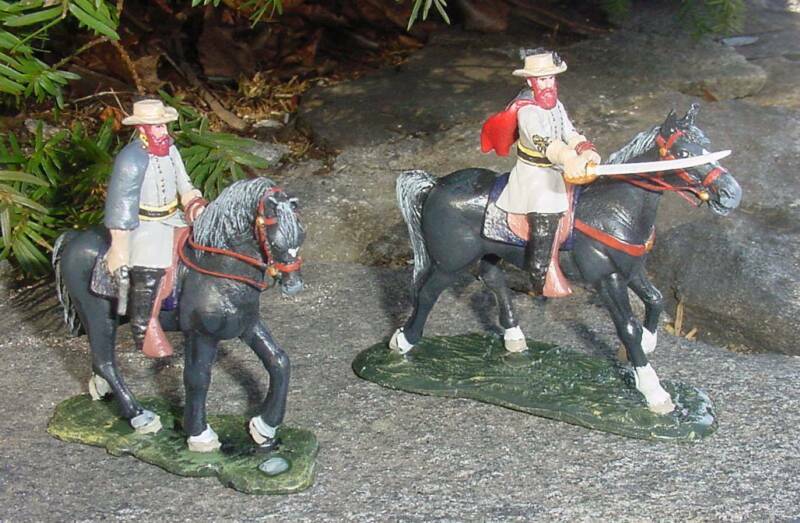 By using kepi and turned-up-floppy hat styles and different colors, Civil War uniforms were converted to depict Terry's Texas Rangers. Note that the Regiment's distinctive emblem, a white star, has been added to the front of each hat also. Further customization is possible by changing the facial hair of each figure (i.e. adding a beard, moustache, goatee, etc.) or hair color. This is particularly attractive if a collector wants several figures of the same pose. of paint and physical changes to produce a figure very different from the original. 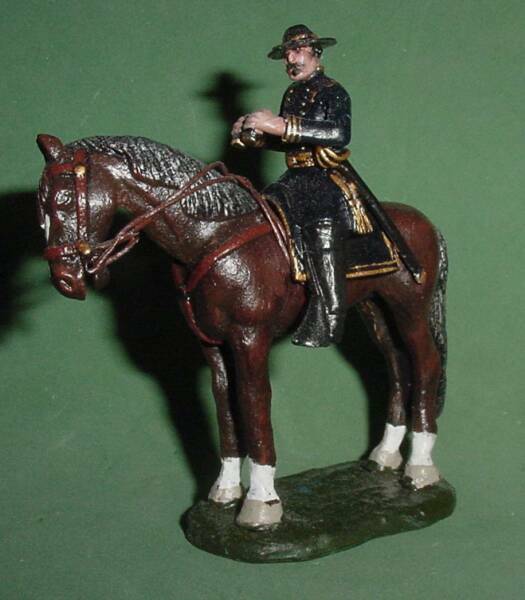 Customization is a special service available from some manufacturers that allows collectors to make minor changes to an existing pose such that similar poses look slightly different from the original and not as though they had been produced by a cookie cutter technique. Customization is usually accomplished by changing hair colors, facial hair styles, hat styles or head positions. 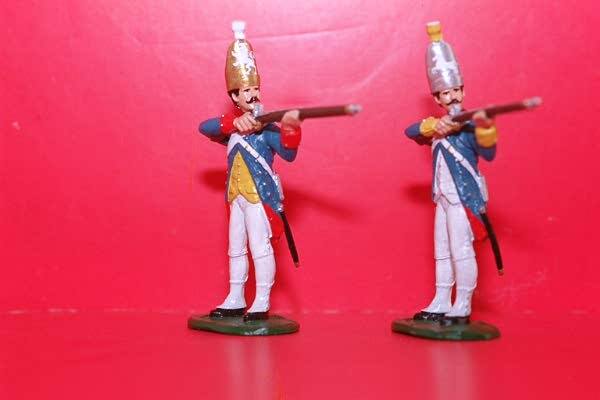 The original Hesse-Cassel Hessians from the LeMan's Collection were modified to produce figures representing the first Hessians sent to fight in America, the Brunswick regiment (left), and Colonel Johann von Rall's regiment (right) which fought the Americans during the American Revolution at the battles of White Plains (Chatterton Hill), Fort Washington and Trenton. Modifications included the use of different colors for vests, helmets and cuffs as well as handlebar moustaches and different hair colors. Note that a heraldic lion and horse were also added to the front of the helmets. Created by cutting a "V " section from the middle of a standard trapper before bending body forward. Solder used to fill cracks. Hole drilled to accept brass rod which served as an arrow. Right arm bent to hold arrow and hand painted with red to represent blood. Arm with musket added to left side. 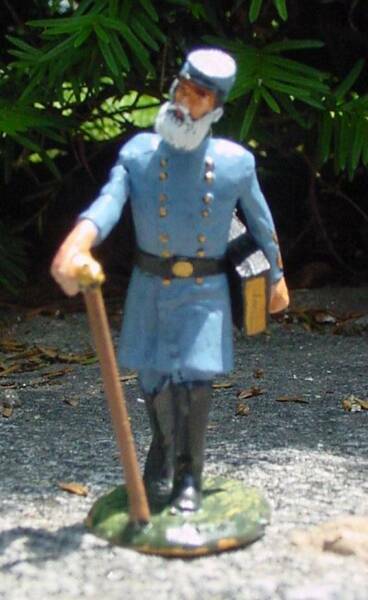 VMI professor leading cadets into battle. 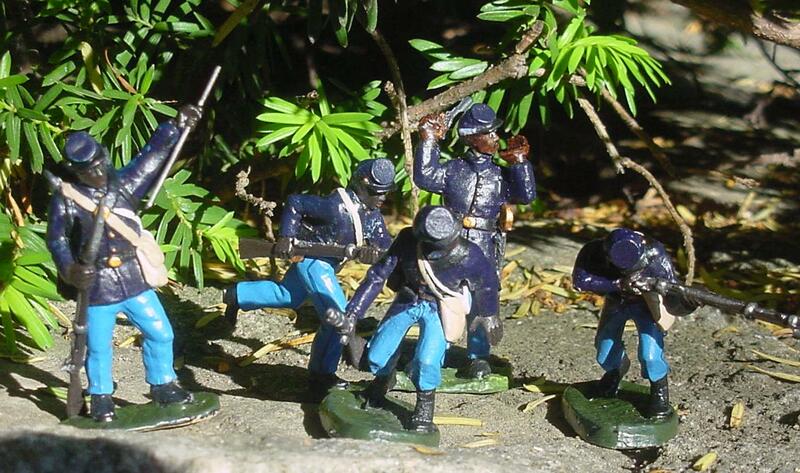 Confederate uniform painted to match customer's requested colors. 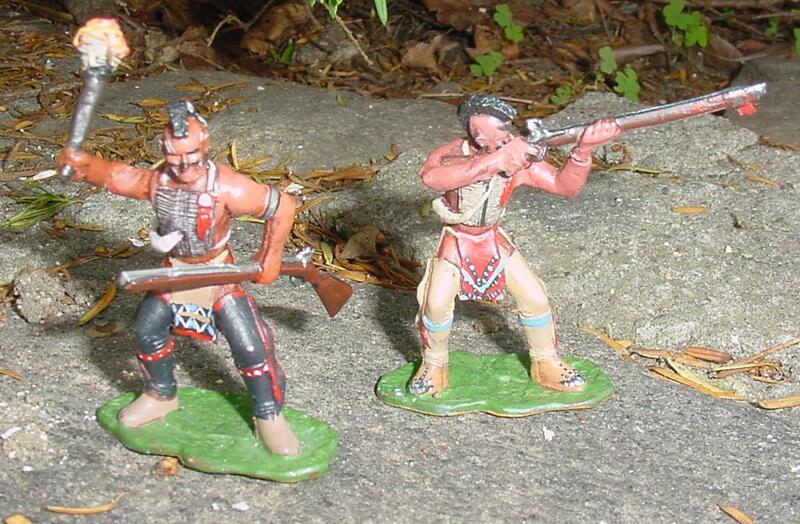 Roger's Ranger and Virginia Culpeper Militia figures converted to Iroquois using Iroquois head and/or different uniform colors. Customization involved use of different hat styles and paint colors. In upper left picture is an artillery figure which originally had the soldier holding his ear with his left hand as he pulled a lanyard with his right. 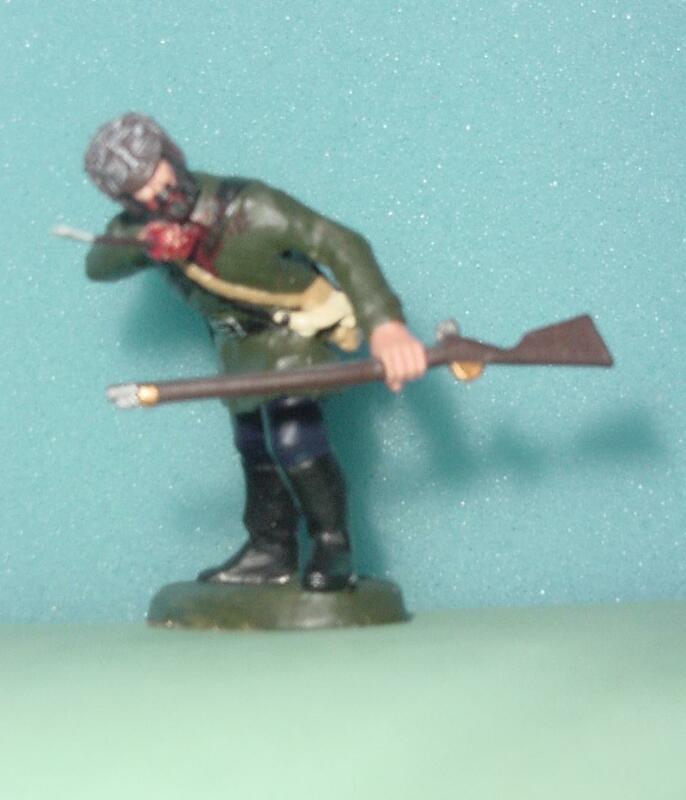 Figure was painted as an infantryman with hand near ear to depict a bullet whizzing by. The lanyard was replaced with a musket. In the lower foreground of the same picture is a figure of a soldier firing a musket with his right hand. 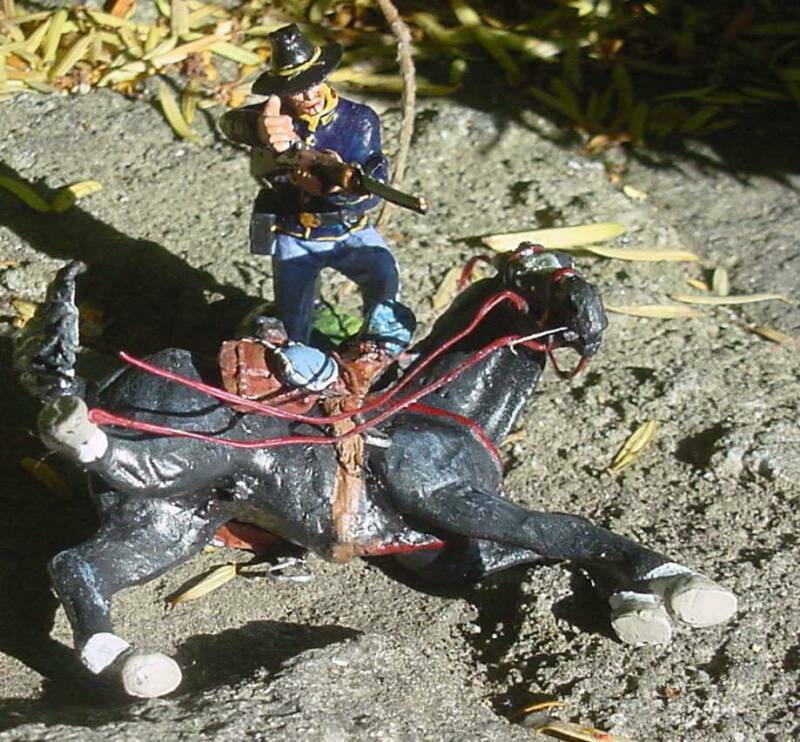 The original figure had a pistol. 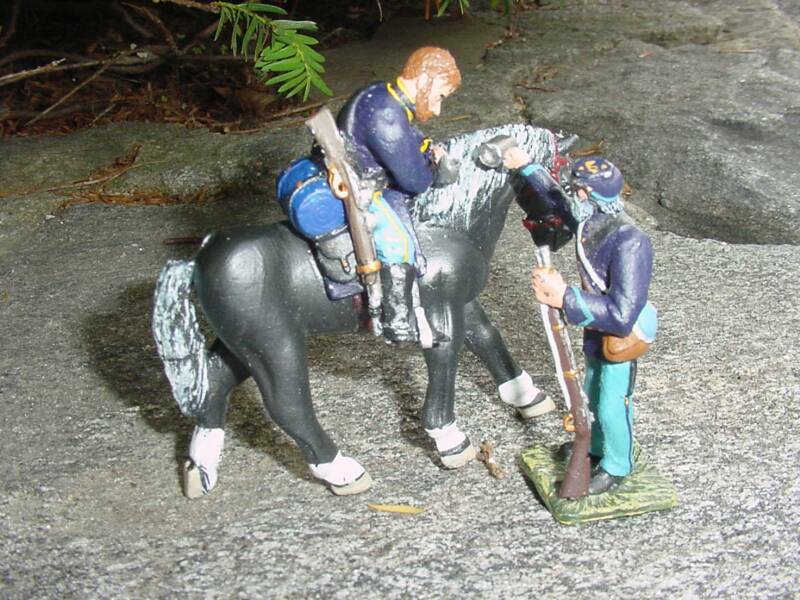 A new figure was created on the right foreground in which the legs of a standing figure were bent into a kneeling figure firing a musket. 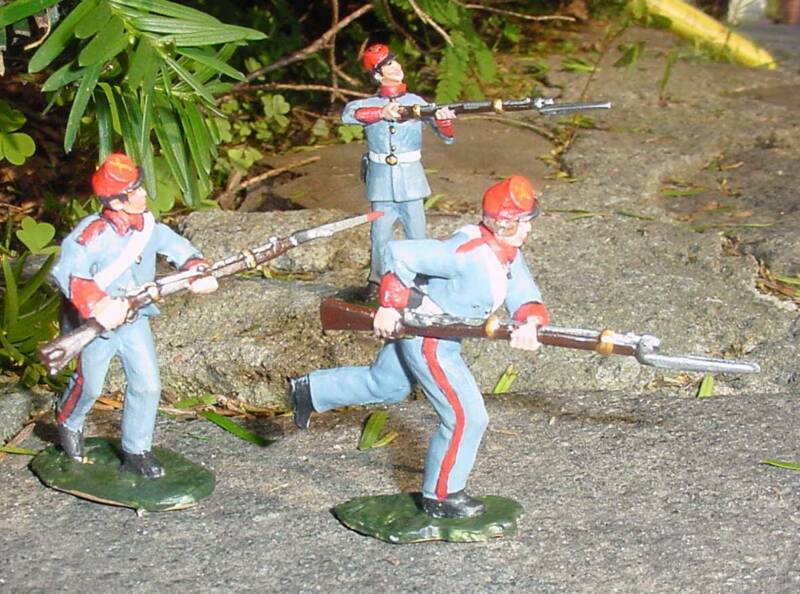 A pistol was added to the colorbearer on the right foreground. 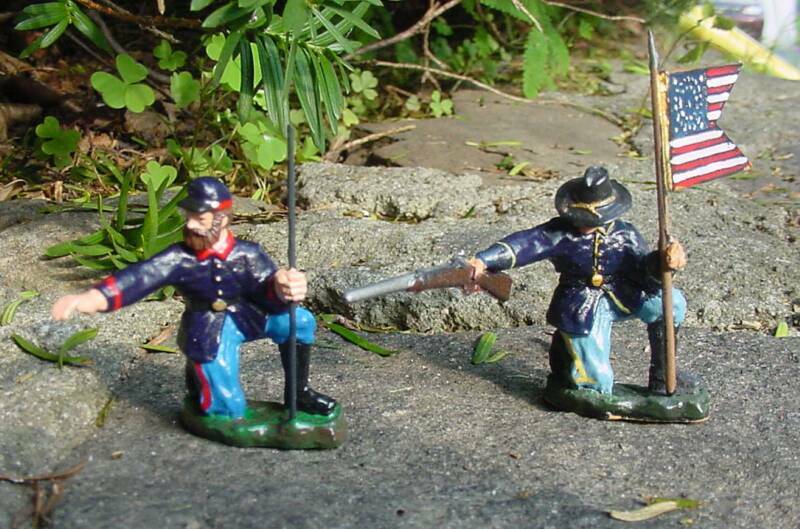 Lower picture illustrates mixture of other custom figures with catalog figures. Note the pins were added to the fence to hold wounded soldier falling backwards off fence. 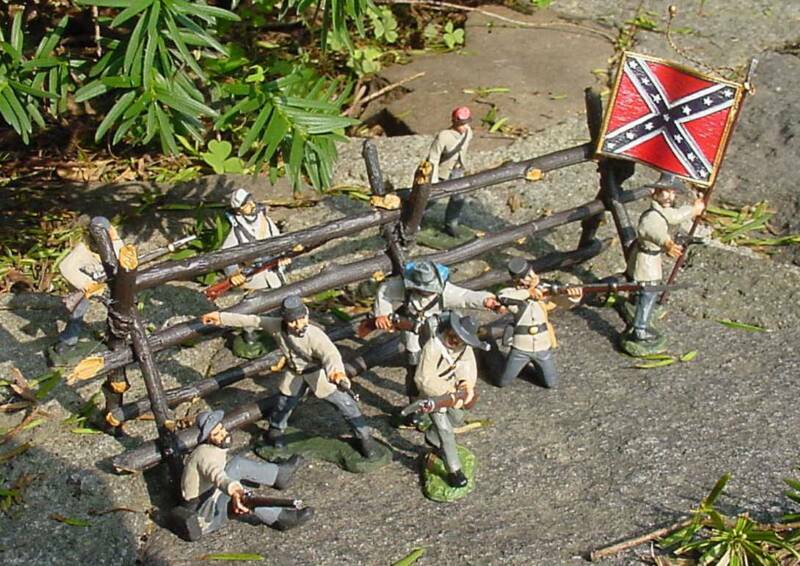 Diorama in the upper right was created by adding standard figures around the fence and pegs to the fence to accept climbers and wounded soldiers falling backwards. The climber was created especially for this scene. 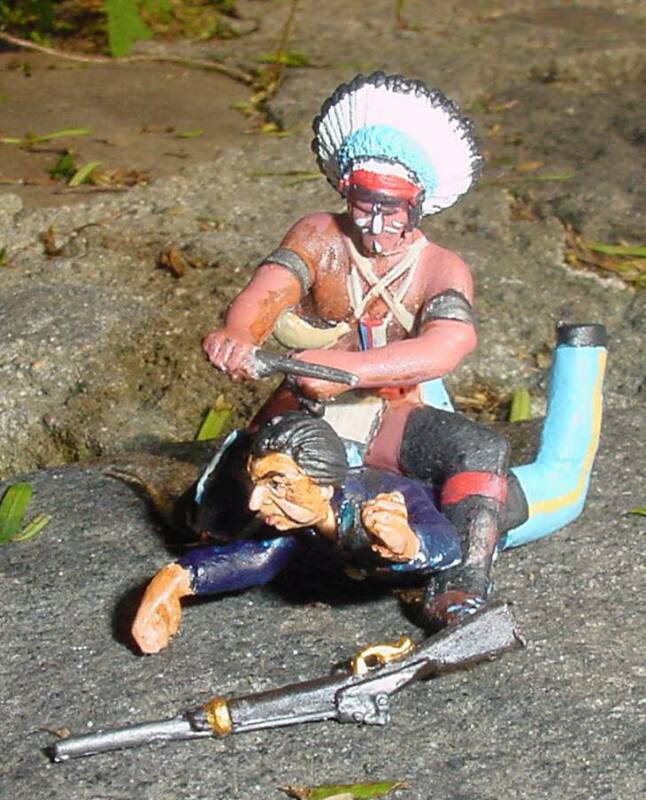 Iroquois scalping set converted by using Indian head with bonnet & wounded 7th Cavalry trooper. 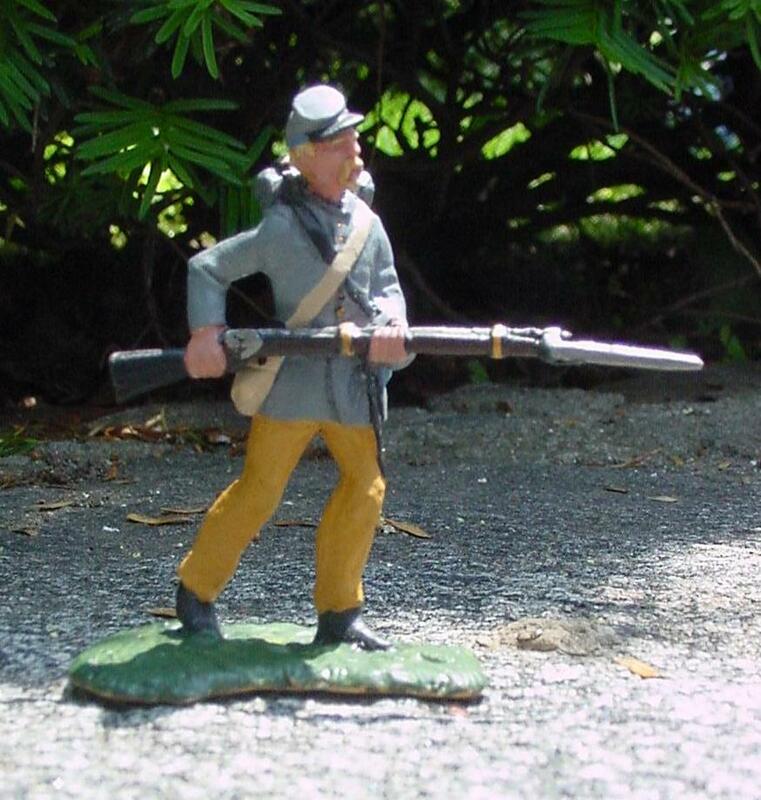 Civil War artillery figure used to create dismounted 7th Cavalry figure by replacing kepi hat with trooper hat, adding flag to pole and carbine to right arm. 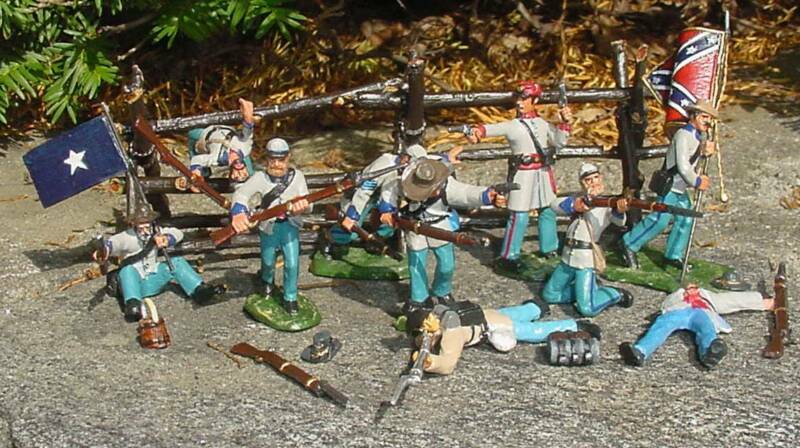 Regular inventory repainted according to picture provided by customer to portray SC Zouave cadets. Custom painting and hat (trooper vs kepi) /weapon (pistol vs rifle) selection. 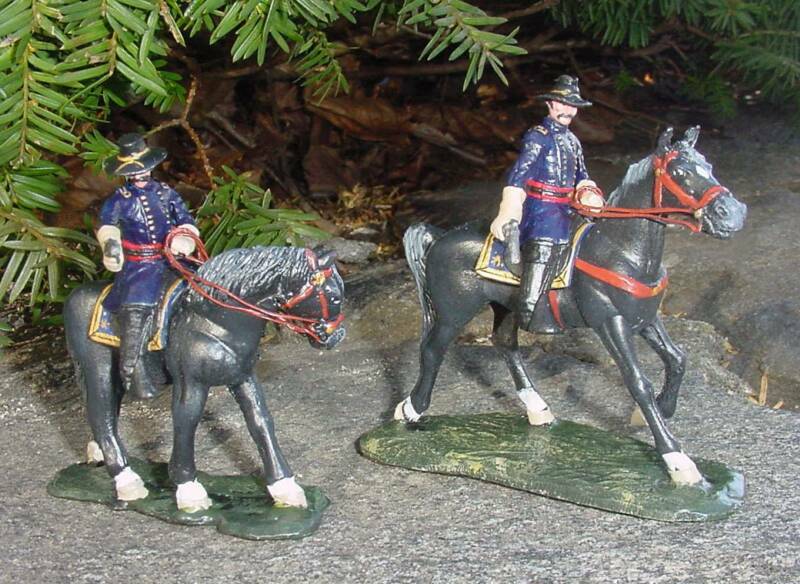 Converting wagon drover with whip (center) to wagon/limber guards or sitting riflemen. 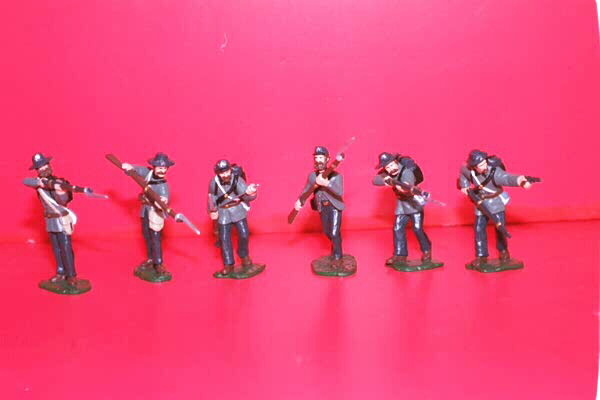 Artillery limber set with new horses, driver & guard. 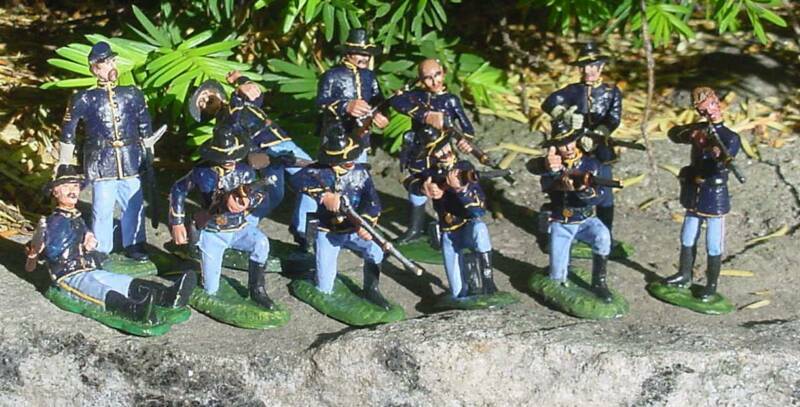 Custom 7th Cavalry with extra pistols and arrows. 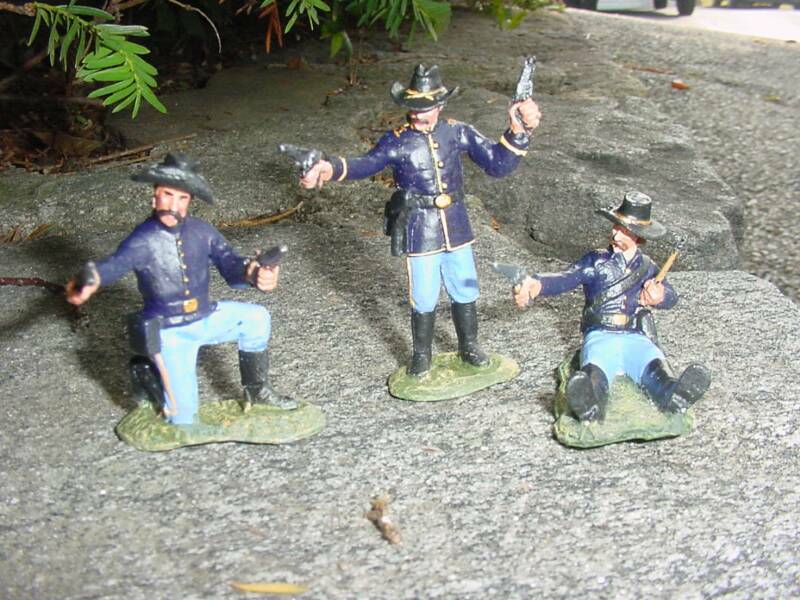 Back row (L to R) - Sargeant observing fire, Wounded trooper, Reloader, Firing standing, Officer. Front row (L to R) - Wounded with carbine, Kneeling (Reaching for cartridge), Preparing to fire, Firing, Cocking carbine, Firing standing. 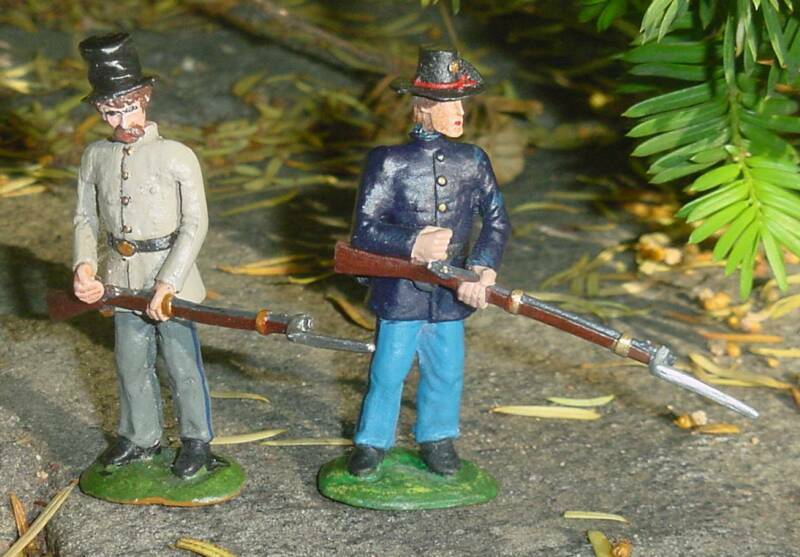 Converting Civil War Standard Union Troops to US Colored Infantry. 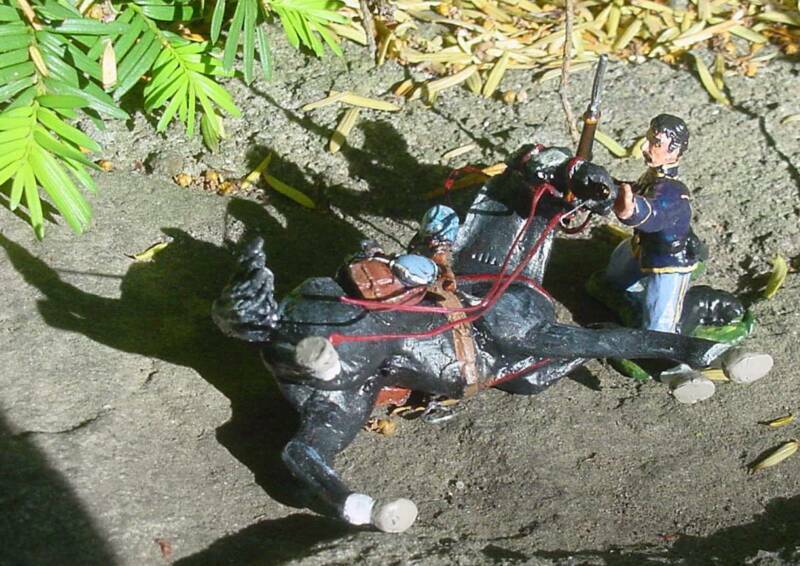 Use to creaate 54th Massachusetts troops. Using hats to convert standard Civil War troops. The release of "An Illustrated Encyclopedia of Uniforms from 1775-1783: The American Revolutionary War" has provided a great opportunity for LeMan's to convert several existing poses to some of those found in this spectacular book as shown below. Other possibilities still exist from this book and a follow-on Civil War book scheduled .for release in June 2009. 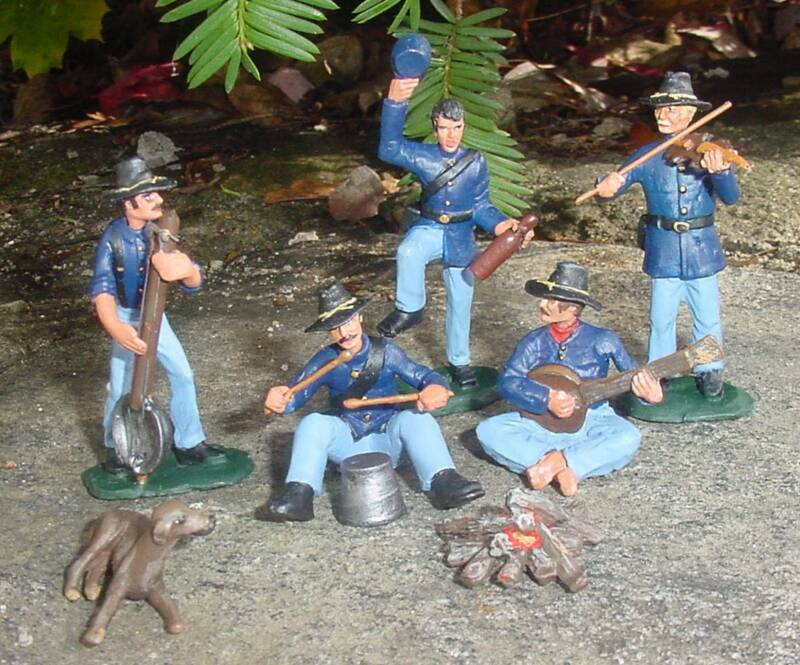 All of the figures above were created from the same pose by using different hats and uniform colors. Ammo box fits in rear of carriage. 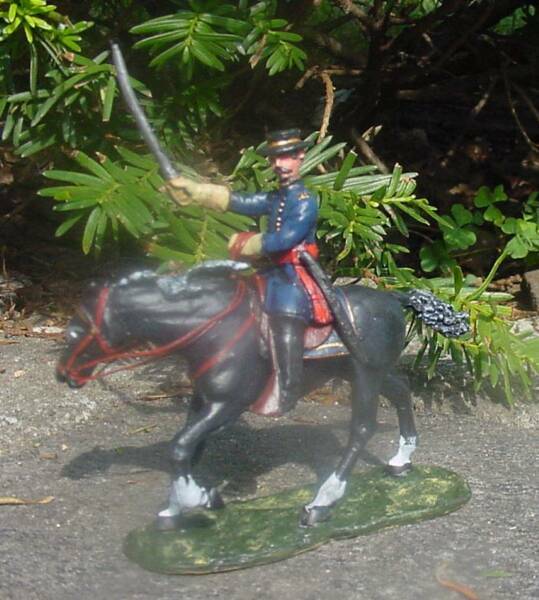 Created by adding tricorn hat to Civil War Guard and soldering heavy boots between base and figure. Musket replaced by flintlock also. All figures created by bending metal, soldering. 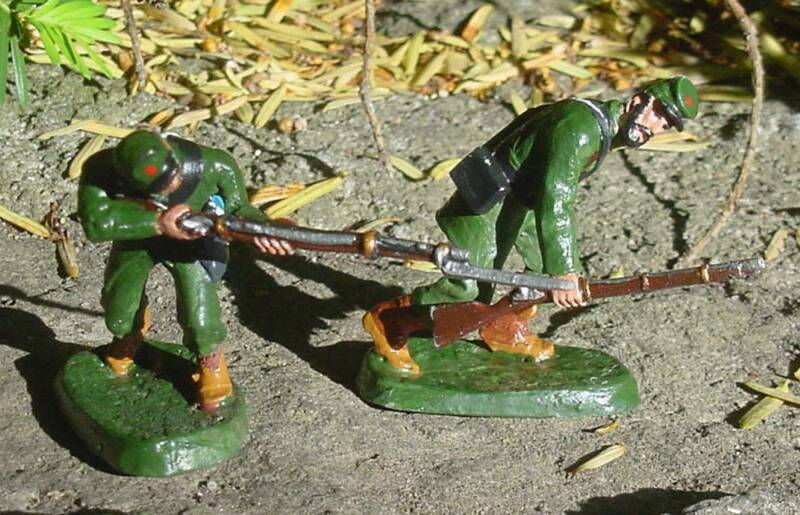 L to R: Drinking from canteen, leaning on rifle, washing face and playing the fiddle. L-R: Carrying jug, carrying rabbit, using rifle as cane, using crutch, Sargeant with sword, carrying backpack & canteen, using 2 hands for support, carrying canteens. List Price: $28 before discounts. 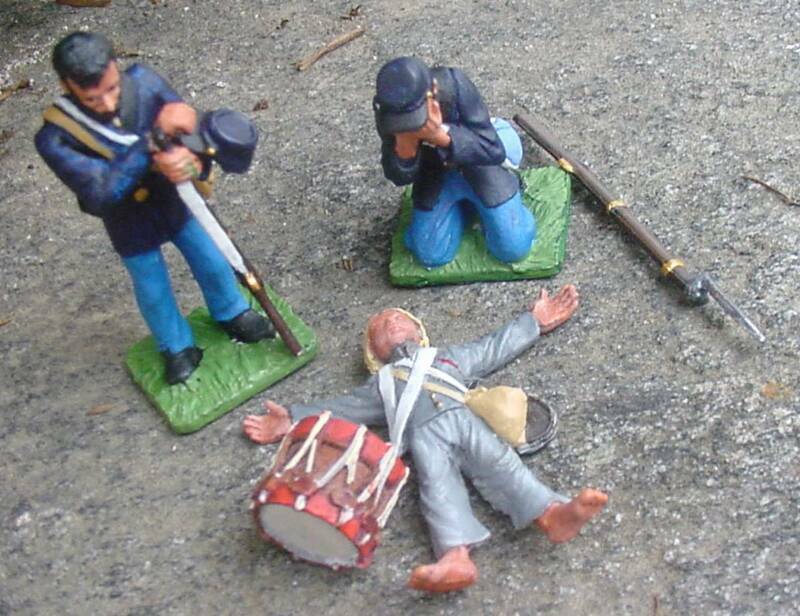 Scene based on the poem, "Ode to a Dead Drummer Boy"